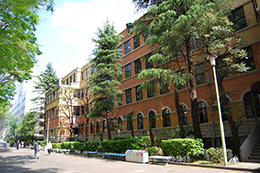 Sophia University has one of the longest tenured English taught programs in Japan. Founded by Jesuits and still under their charter, Sophia gained popularity during the postwar period with American GI’s. Sophia has continued its well staffed, English based Faculty of Liberal Arts program ever since as the university boasts 1,500 international students at any one time, most all of whom are within the FLA(Faculty of Liberal Arts) department. The three divisions within the FLA department are Comparative Culture, Social Studies and International Business, each of which can be further broken down into further subdivisions of focuses and majors of study. Within are the standard liberal arts programs, such as history and literature, but Sophia provides an Japanese/Asian-centric perspective that directly pertains to the locality of the region. With relatively broad credit requirements, students are incentivized to explore topics outside of their particular field of study whilst it is recommended that a major be picked by a student’s junior year. Outside of the liberal arts department students are also encouraged to explore other departments within the university. 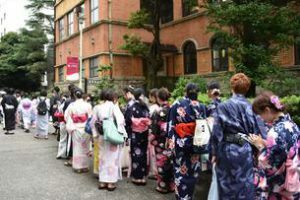 While some classes in other faculties are taught in English, classes taught in Japanese are open to those with a sufficient level of Japanese proficiency. Eight credits of foreign language courses are required from all prospective FLA graduates. If the student is a non-native Japanese speaker then these required credits must be filled with Japanese language courses, if he/she is fluent in Japanese then those credits must be filled in other languages. The Japanese language courses at Sophia are demanding, but with dedication and a considerable time investment, a student can from scratch, graduate the four year program with business level Japanese proficiency. There is also an intensive track that students may choose to enroll in, which demands twice the amount of classroom time and credit hours accordingly. The Green Science and Green Engineering programs are also English based within the Faculty of Science and Technology. Started in 2012, these programs aim to apply cutting edge scientific experimentation to research and develop sustainable energy sources. These programs are closely tied to research techniques offered at the postgraduate level, and prospective undergraduate students will have the opportunity to utilize their equipment and methods. Because of Sophia’s foreign heritage and long tenured English based programs, student life at the campus is greater accustomed to this internationality than some other universities with budding English taught degrees. 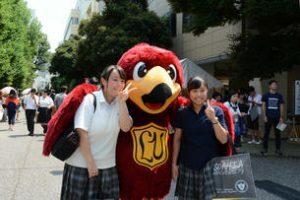 Clubs (“circles”), sports teams, and other extracurricular activities often openly accommodate non-Japanese speakers, with the opposite also occurring; English based extracurricular communities openly accommodating non-English speakers. 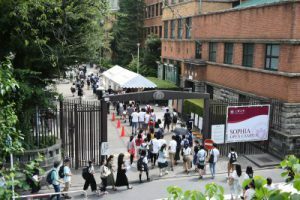 The campus’s centrality within Tokyo allows easy access to social hubs, while its proximity to the business sectors open opportunities for internships and part-time work with the school also offering help to those interested. Housing is also available as the university owns and manages international dormitories about a 30 minute train ride from campus. Sophia-affiliated dorms are also available, as well as assistance if a student has found an apartment that the university then approves of, in which case they may offer a co-signature when the lease is made. The application fees for the FLA program is JPY 35,000 and the Green Science programs at JPY 30,000. Tuition prices have been steadily increasingly annually at Sophia. As of 2018 prices sit at JPY 784,200 per semester for the Green Science programs and for the Faculty of Liberal Arts, JPY 154,800 per semester plus JPY 31,700 per credit (the Freshman credit limit is capped at 20, after that it is raised to 24). Both programs are subject to a JPY 200,000 Entrance Fee to be paid once upon matriculation. Proof of English proficiency, standardized test scores, and official transcripts are to be accompanied by a short essay and two letters of recommendation for both faculties. College student in Tokyo, writing articles with the aim at improving everyone's experience in this country and city as well as to help people achieve their ambitions.